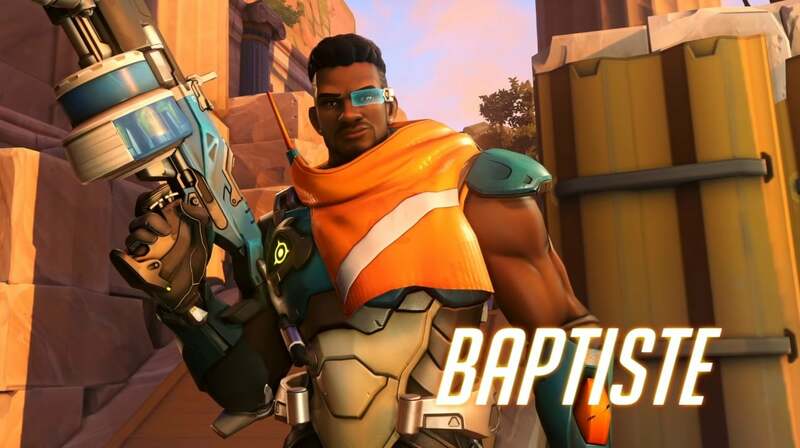 After months since the last hero release, Overwatch’s new hero Baptiste has finally been released and is now available to players on PS4, Xbox One and PC. The hero has been rumored for a while and after spending some time on testing on Overwatch’s PTR, it’s available in the game. It’s no secret that everyone wants to do damage in a game, and the release of a new support-style character is a win-win situation. Those who were hyped about combat medic will get to test him now, while those who always play healers can finally relax and enjoy some damage. It’s worth noting that the 30th hero in Overwatch, like the rest of the heroes that were introduced earlier, is free. Baptiste is a support hero, which means he has healing and protection properties which boost other players who tank or deal damage. His primary weapon is called the Biotic Launcher with burst-fire which can fire three rounds at a time. The secondary fire of his weapon is used to heal characters in need and is called Regenerative Burst. The healing is over time. His skills include Immortality Field and Exo Boots. Immortality Field is tossed out when a dangerous situation arises, and can be used to protect allies surrounded by enemies who are using their “ultimate skills.” Additionally, Overwatch’s new hero is equipped with Exo Boots which allow him to jump over obstacles and dodge enemy contact. Finally, he’s equipped with Amplification Matrix as an ultimate skill. Once the hero uses it, the damage dealing onto the enemies doubles as well as healing. Blizzard also released a video which showcases Baptiste in action and shows the effects of Immortality Field when his team gets attacked by the explosive ultimate skill of the enemy hero D.Va. Blizzard has teased the hero for some time now. In February, the company published an encoded message from the enemy team Talon, a criminal organization which Overwatch fights throughout the story. The message quoted a combat medic Baptiste. Later in the teaser video, we learned more about Overwatch’s new hero, about a painful childhood story which led to making bad choices. Through his career in Talon, Baptiste had a “change of mind” which allowed him to see good and use his skills for good. Ana’s nanoboost healing effect is reduced to 250 from 300, while the radius of Hanzo’s Sonic Arrow increased from seven to nine meters. Lucio has had a rollercoaster of changes with the speed boost’s amplifications being reduced from 70% to 50% and Cross Fade speed boost effect’s reduced from 30% to 20%. Wall Rider skill was buffed, with speed boost it increased from 20% to 40%. Mei’s Primary Fire damage saw a boost from 2.25 to 2.75 which equals 45 to 55 damage per second. However, her Ice Wall’s health fell from 500 to 400. Moira’s healing abilities have also come with a boost, healing over time skill was increased from three to four seconds, and total healing from 50 to 65. All changes can be checked out on Blizzard’s Patch Notes. Meanwhile, have you tried Overwatch’s new hero? What do you think of him?